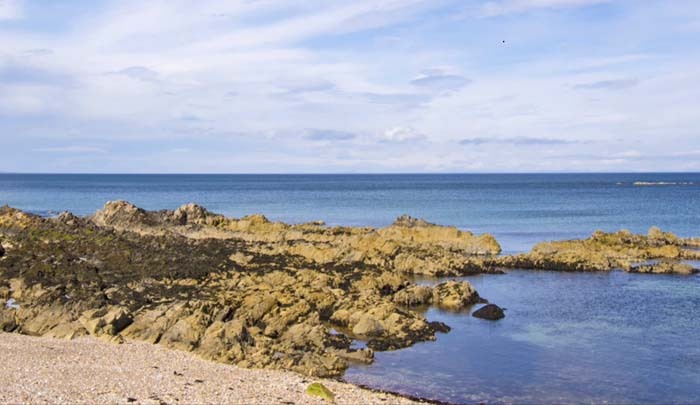 Situated on the Moray Firth coast, Portessie is one of a number of old fishing villages that lie on a three-mile stretch of shoreline to the east of Buckie on Scotland's 'sunniest north east coast'. Moray is known as the Scottish Riviera as it gets very little rain and has a warmer and gentler climate than most other parts of Scotland. It's an unspoiled coastline, with dramatic cliff scenery, beautiful beaches and picturesque villages such as Gardenstown and Pennan. Families will love the extensive beach at Cullen and enjoy local opportunities to ride, golf and watch rare birdlife - the RSPB Reserve at Spey Bay is a must for keen birdwatchers. The Moray Firth has one of only two resident populations of bottle-nosed dolphins in Britain and regular boat trips leave from Buckie and Macduff harbours on dolphin-watching expeditions. There are a multitude of golf courses along this coastline. A wonderful base for a magical holiday experience. 10-minute walk along the seafront from cottage. and the numerous villages along the coast. Charming cottages by the sea near Buckie a great place for a holiday on the Moray coast and is in an ideal location to explore all the delights of this special part of Scotland.